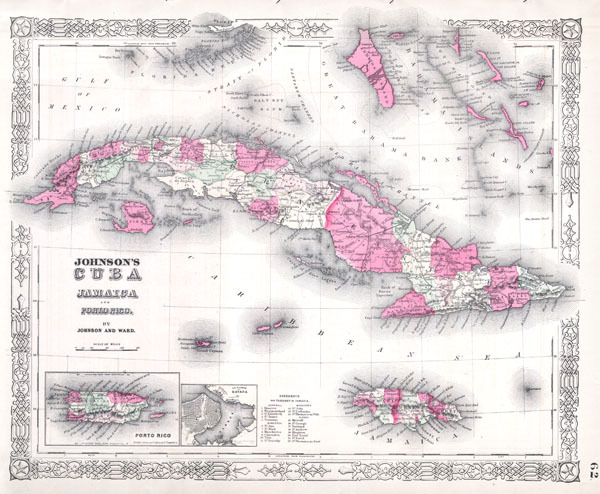 Johnson’s Cuba, Jamaica, and Porto Rico. This is a beautifully hand colored 1864 map of the West India islands of Cuba, Jamaica and Porto Rico by A. J. Johnson and Ward. Covers from the Florida Keys south through the Cayman Islands to Jamaica and west to the Bahamas. Each region is depicted in considerable detail with special attention to districts, roads, railroads, and cities. There is an inset map of Porto Rico and another of Havana City.